Finnish artist Kaarina Kaikkonen creates sculptures from the cast-oss possessions and clothing of others, her materials speaking eloquently of their owners' absence. 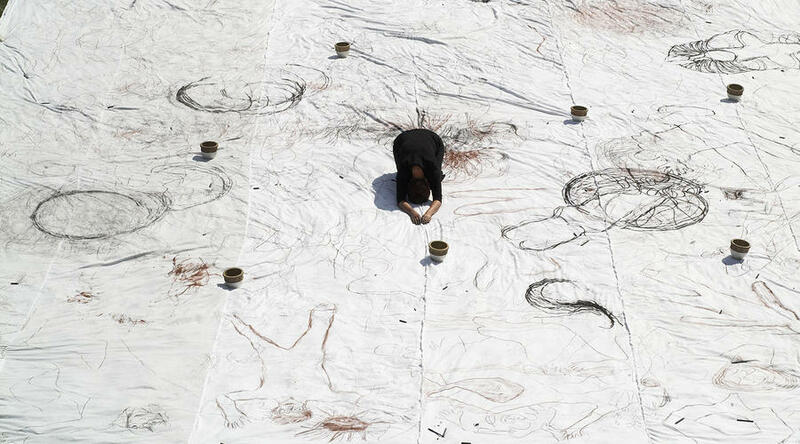 Polish-born artist Monika Weiss makes video projections and large-scale drawings that also refer to trace and memory by providing a visual and physical record of her performances. Two separate but complementary solo exhibitions beautifully captured each artist's individual vision and approach. Since 1987 Kaikkonen has mainly worked with men's jackets arranged in massive installations. Here the jackets were accompanied by small sculptures made of disassembled women's shoes which were reminiscent of flowers or insects. Weiss's multimedia work "Leukos-Early Morning Light" (2005) was created on the grounds of Lehman College in the Bronx*. 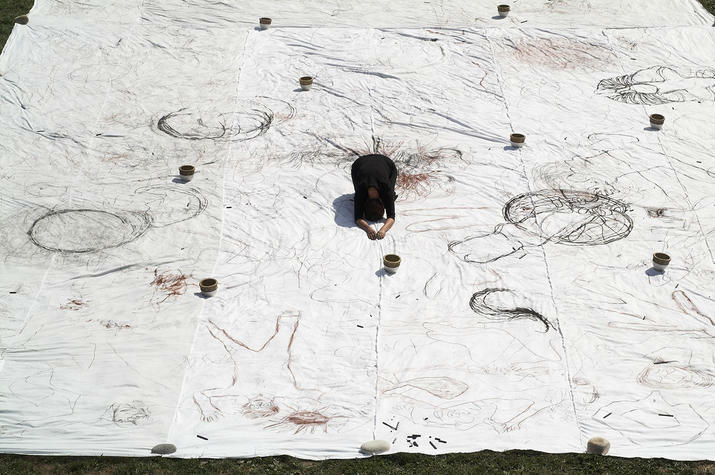 She spent three days drawing her silhouette onto the surface of six long sheets of cotton. Other participants in the project left their own marks, while wind and rain darkened and blurred the graphite drawings. 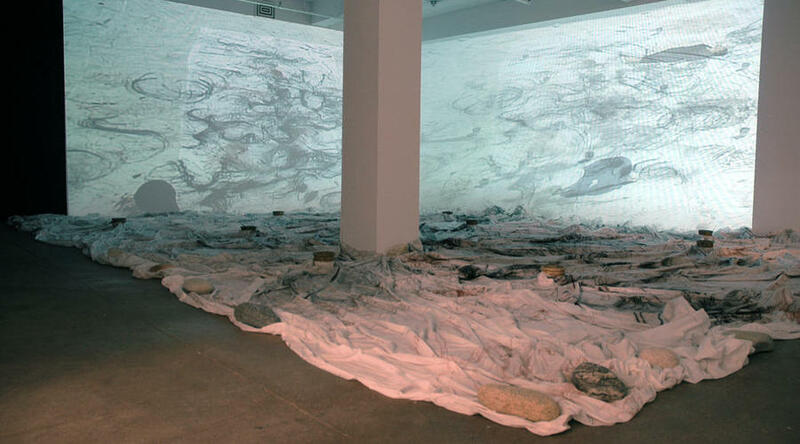 This cotton canvas was installed in the gallery, weighted down by rocks, with a video of the performance projected on the walls behind it. An accompanying soundtrack of opera arias [composed by Weiss] underscored the disquiet and mystery that united these two artists' bodies of work. 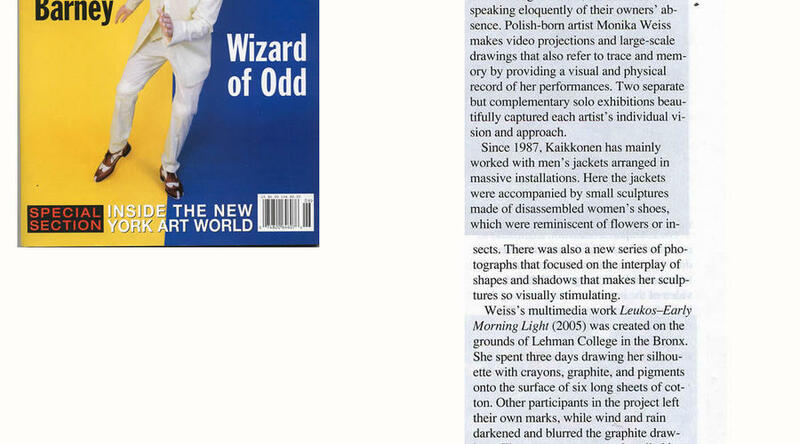 * In 2005 Monika Weiss's first retrospective exhibition was held by the Lehman College Art gallery (CUNY). The exhibition included a series of performances (outdoor and indoor) including Leukos, as well as sculptures, videos, drawings and photography.